One-of-the-kind: 19th century needlepoint colorful tapestry in the center of the pillow. Decorative one-of-a-kind pillow embellished with a 19th century metallic woven gold trim. Decorative pillow antique textile framed with 18th century hunter green stripe silk velvet. Throw pillow embellished with antique green and gold silk rope trim all around. Golden color silk backing. The antique tapestry depicts a large blue urn with flowers and vines all around. Decorative cushion in shades of green, gold, red, black, brown, red and blue. 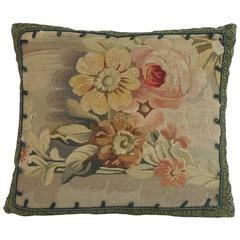 Decorative antique textile pillow handcrafted and designed in the USA. Closure by stitch (no zipper) with a custom made pillow insert. Size: 19 x 19 x 6. Antique tapestry fragment with basket of fruit and floral design made into a pillow with down cushion. Continental, early 19th century. Shows expected light wear and age. Pair of custom pillows made with 19th century metallic embroideries appliqued on silk mohair. 19th century metallic trim at sides. Golden silk backs, down inserts, zipper closures. 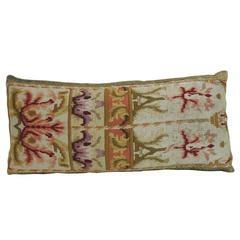 French Aubusson Tapestry pillow, circa 19th century 430p.